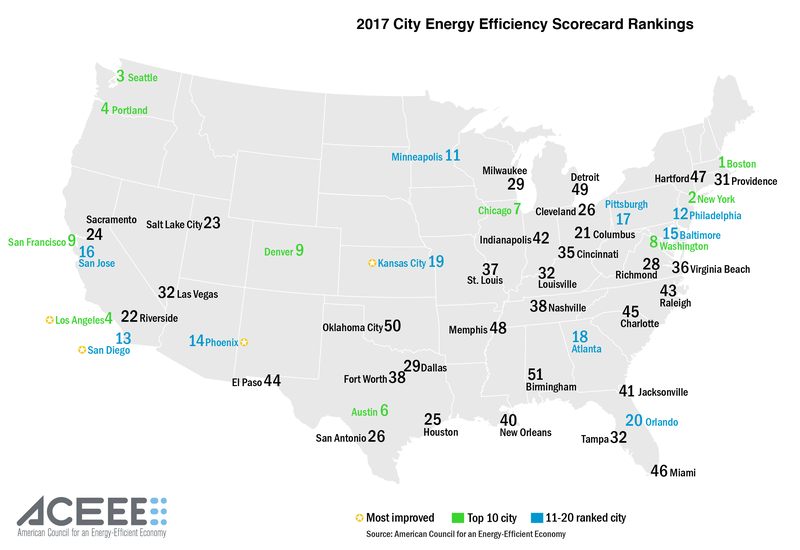 The American Council for an Energy-Efficient Economy (ACEEE) released its biannual scorecard that ranks 51 large U.S. cities on energy-saving efforts in five areas: local government operations, community-wide initiatives, buildings, energy and water utilities, and transportation. Boston retained the top rank for the second year in a row with 84.5 points (out of 100), while New York, Seattle, Los Angeles and Portland rounded out the top five (79.5, 78.5, 76.5 and 76.5 points, respectively). Los Angeles, San Diego, Kansas City and Phoenix were all touted as the "most improved" cities, yet the report notes 32 cities improved their scores from 2015 to 2017. To boost scores, many cities have adopted benchmarking and transparency policies, updated building codes and/or have developed climate goals, however all 51 cities have room for improvement. Only 18 cities received at least half of the possible points on the scorecard. As cities grow in population and increase focuses on renewable energy goals, many metro areas are making concurrent energy efficiency plans. As the report points out, achievable benchmarks are the best way to implement and pursue these plans — which was exemplified by the dozens of cities that adopted targets and improved their scores from 2015. However cities cannot reach these benchmarks without the help of their citizens. In order to keep citizens more aware of energy efficiency — on a citywide or personal level — officials should work with utilities to ensure residents have access to energy usage information that is easily attainable online or via a mobile app. In Boston, information on energy is only one of the many sets of data that citizens have access to through Analyze Boston, a new citywide open data platform. The site allows users to see data on Boston's public safety, transportation, permitting and other topics, which has led to improved city services. The initiative was spearheaded by Andrew Therriault, the city's first chief data officer — a title that many other cities will likely adopt in the near future. While energy efficiency is not the only key to developing a smart city, it is one of the main threads that connect developments in utilities, buildings, transportation, waste and other topics. As referenced in the report, cities should focus on clear and transparent ways of reporting and collecting energy consumption data to ensure that benchmarks continue to be met and scores continue to improve.